Diversity is a great thing in life as it’s what truly allows society as a whole to function at an optimum level of efficiency. Imagine life without diversity for a moment. What if there were nothing but carpenters in the workforce? Everyone would build themselves a nice home but nobody else would NEED one, so what would these carpenters do to earn a living? Similarly if everybody was a doctor who would they treat other than themselves and their own kids? If everybody was a farmer they’d feed themselves, but nobody else would ever be in need of beef, poultry, grains and vegetables. Simplistic examples maybe, and I’m sure you could find some potential uses for their skills beyond their immediate family, but the basic premise remains the same. Diversity in the workforce means that the carpenters build offices for the doctors, barns for the farmers and homes for them all, while the doctors treat the carpenters and farmers and their families for their medical needs and the farmers grow food to feed the carpenters and doctors. And so on and so forth. Diversity also contributes to the social fabric of society ensuring that there’s never just one worldview that dominates. The life experiences of the older populace is balanced by the newer outlooks of the younger set. The gender and racial differences in society (provided they aren’t forcibly disenfranchised as too often happens throughout history) ensures that the cultural perspective never becomes homogenous. But what does all of this have to do with music? Well, isn’t it obvious? Right now we’re in March 1948 a time when the dominant musical tastes in America are fairly rigid and narrow, at least if you look at the Billboard Pop listings where the third week of March has three different versions of both Now Is The Hour and Beg Your Pardon in the Top Ten. If you want to go further down the charts it doesn’t get any better as we see two more takes of Now Is The Hour in the Top Fifteen where they’re joined by another rendition of I’m Looking Over A Four Leaf Clover, which is also the #3 and #7 song in the country. So just three songs make up eleven of the fifteen biggest selling records in America! That’s what you’d call a LACK of diversity. But rock ‘n’ roll was changing that. Not overnight, for rock was still confined strictly to black audiences, particularly younger black audiences, but those listeners were growing ever more powerful economically which in turn would lead to more sales, thus more exposure for this music and down the road that exposure would bring about more mainstream acceptance of it. The more popular it became the more diverse the overall musical experience became. Rock itself was nothing if not diverse right from the start. We’ve seen how all of these seemingly disparate stylistic threads were pulled together into one – the gospel-like shouters singing of decidedly secular themes, the honey-voiced harmony groups seductively crooning their way into your heart, the frenzied saxophonists keeping the party swinging – all of it combined to make rock as a whole much stronger and more enduring than it’d have been if only one facet of it had taken hold. Like jazz before it rock artists were already showing the need to chart their own course stylistically rather than simply follow the trends begun by others. In fact arguably rock’s greatest strength over its now-seven decade long odyssey would be how its top artists were celebrated most for their creativity, for stepping outside of the approach that defines the present as it had the recent past and trying to take rock in new directions. As befitting his role as rock’s founder Roy Brown was already shaping up to be one of the leading exponent of such aims, even if occasionally he took a bit of a misstep in the process. Seven months ago Roy Brown was a club act, fairly successful around the Gulf Coast region and in possession of a self-penned song in a totally new style which got him signed to a record contract. When that record, Good Rocking Tonight, was released in September, it launched rock ‘n’ roll – and Brown’s career – in the process. So you’d think Brown would be sticking rather closely to that precedent, trying to refine it perhaps if he was ambitious, or merely mimic it if he wasn’t, riding that one moment of inspiration as far as it could carry him. But Roy Brown did nothing of the sort. Although he WOULD revisit the precise framework of “Rockin” a few more times for hits, and broached similar territory thus far with Mighty Mighty Man, he also set out to explore different avenues that brought him additional acclaim as well as additional hits. He’d already proven to be equally skilled at mournful laments with Miss Fanny Brown as well as the A-side of this record, ‘Long About Midnight, and for the flip he came up with something out of left field that was unlike anything he’d done before or would try again. In the hands of others Whose Hat Is That? might be at risk for being presented as a novelty, or at least something in which humor was its main drawing card. The storyline concerns a man who finds repeated evidence that his wife is cheating on him and so the options for the song are relatively few – he can grieve over this, he can become vengeful or he can become exasperated which might lead to some laughs, as it had when a similar theme was explored on the song Cabbage Head which was an old Jewish tune that recently had been cut by Tom Archia with Dr. Jo-Jo Adams on vocals. While that did provide a few mild guffaws it wasn’t enough to save it from the repetitiveness of the scenario. Brown may have even heard this routine in the clubs and used it as inspiration, but if so other than the basic topic and a few pieces of evidence uncovered as to the affair the record is entirely different in every way starting with the music. The intro, at least first eight seconds of it before the still-outdated horn section intrudes, sounds ten years ahead of its time. Its piano and drum based rolling boogie would become a cornerstone of the rock’s first decade and a half and this is evidence it was present – if not taken full advantage of – from the very start. After such a rousing beginning the aforementioned horns quickly dampen the spirit but at least they keep up the pace and allow Brown to come into the picture at full stride, dropping us right in the middle of the story, his accusations framing the song in no uncertain terms. In case you’re wondering, he’s chosen vengeance. When we look back at the personas Brown has inhabited to date on record what’s most impressive is how he takes on entirely different characteristics that allow for him to expand his lyrical approach. From master of ceremonies at jumping house parties to an enthusiastic novice in the bedroom to more of an inexperienced lover burned by the wily ways of an older female he’s like a character actor who effortlessly loses himself in each role. Since this is 1948 I’d say he was shaping up to be a bit like Walter Brennan in that regard, although he certainly had the star power of Cary Grant, Clark Gable or John Wayne. Maybe the best comparison would be Humphrey Bogart, someone who commanded the screen in starring roles yet was never merely “playing himself” as it were, but was willing, even eager, to stretch out and inhabit characters that required him to flex his acting muscles a bit more. Brown’s role here is a fairly simple one, there’s not much subtlety to what he’s delivering (his primary gimmick here is the fervor in which he throws in the word “Well” at every opportunity), but because his persona is unlike the past versions of Roy Brown on record it affords us an opportunity to see just how convincing he can be in this guise. Though the premise is pretty basic he’s caught in a tricky position because of the particulars of the story. He’s got to be somewhat of a commanding presence, delivering threats of retribution for his wife’s philandering which of course requires him to appear fairly strong, yet the mere fact his wife is entertaining every sailor in port while Roy’s out at his job or bumming around a pool hall shows that he’s anything BUT strong, or at least not virile enough to keep his woman satisfied. Brown seems to understand this and so he gradually ramps up his indignation until it turns to anger, which – while all too understandable in a real-life human drama – shifts the mood of the piece from a voyeuristic one that has you the listener in the role of an eavesdropping neighbor bemused at the marital tussles next door, to one where you become a potential witness to assault with a deadly weapon and possible homicide. Needless to say being forced into giving a statement to the authorities should Roy carry out his threats and then enduring a trial with you as a prime figure on the witness stand is more than you probably bargained for when laying down 79 cents at the record store for this. Had you known it would come to Brown telling Roy Jr. to bring him a baseball bat to bash his mother’s skull in you’d probably have listened to ‘Long About Midnight a second time rather than flip the record over! Or else he’s counting on a justifiable homicide plea to get him off lightly for his soon-to-be-committed bloody murder, in which case disregard my previous comments entirely! Oh well, there are still a few good scenes in this production and Brown gives a wholly energetic performance, sounding like the musical equivalent of a method actor. It’s certainly a different approach to what he’s laid down thus far, not only in content but in his strident vocal delivery, showing that he was more than willing to tackle diverse roles on record from the start. What the heck, a lot of leading men DO have at least one defining bad guy part in them – Henry Fonda in Once Upon A Time In The West comes immediately to mind – so Brown can be forgiven, even in a way applauded, for thinking outside the box, though admittedly in music it’s not quite the leap as it is in film. He’s also smart to surround himself with solid supporting actors to add some color to the rather shallow story, namely Leroy “Batman” Rankins who gets a featured solo that starts off strong before somehow wandering off into a whimsical passage that sounds a bit like experimental jazz on acid. Interesting if not quite sensible. But like the others backing him they all play with the appropriate gusto which at least keeps you from walking out on the performance as the plot fails to progress, the dialogue gets more repetitive and the tone of the entire show gets more troubling the longer it’s allowed to go on. By now I guess you can tell that Whose Hat Is That? is probably one play that is destined to never reach Broadway after they’ve taken it on the road to try out on unsuspecting locals in the sticks. Though they give it their all it’s just not a very good idea to start with (homicidal maniacs ranting on record rarely are), but I DO think it served a somewhat useful purpose in Brown’s budding career. Any actor, or any singer, needs to understand their own strengths and weaknesses as well as give audiences a chance to weigh in on what types of personas he should be inhabiting on record. You never know what will work and what you’ll feel comfortable doing until you try and if some turn out to be creative dead ends, well that’s okay too because you can cross that part off the list and move on to something else. So in that spirit as long as you think of this along the lines of an up and coming actor taking on a role for the experience alone and leave it at that it’ll be something you’ll tell your friends about seeing when the actor in question goes on to become a star… or is arrested for unspeakable domestic crimes, whichever comes first. 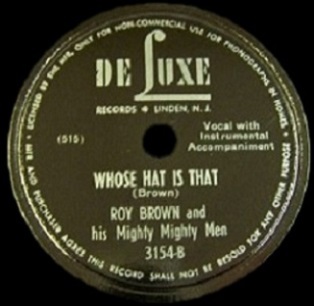 Leave a reply on "Roy Brown: “Whose Hat Is That?”"